The Rural Water Project is going to save lives in Haiti. In fact, it already has. One Hundred For Haiti began supporting our friends from Peacework Medical and their work building water tanks to prevent cholera in the Ranquitte region of Haiti. One Hundred For Haiti paid for multiple tanks to be built in extremely remote areas of the region. Peacework had built tanks after the outbreak of cholera in 2011, and as a result of both those tanks and the new ones, cholera deaths in the region dropped to zero. 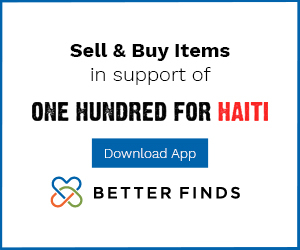 In 2015, One Hundred For Haiti offered to fully take over the project from Peacework, who were focusing on work in the USA rather than in Haiti. This shift meant that One Hundred For Haiti took over the maintenance of twenty existing tanks and the eight that we had funded, but we also decided to expand the project and build six more tanks in areas where local people told us firsthand that there was a need. We are not restricting ourselves to these tanks either: where there is a need, we will be there. Women in rural villages often have to walk and hike incredible terrain to access clean water sources. With the RURAL WATER PROJECT, villages are able to source water locally, saving local women tremendous amounts of time and allowing them to avoid injuries and danger as they seek water. The closer water is to home, the safer everyone is, especially women in the region we serve. 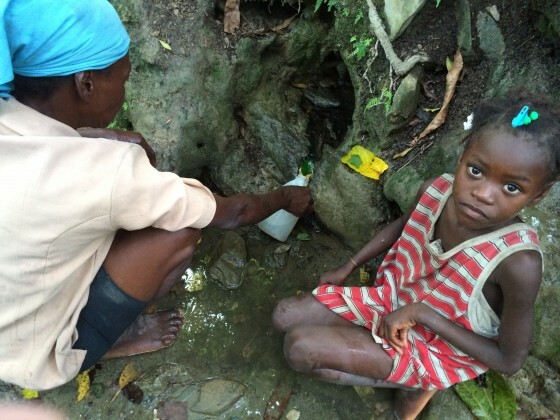 When clean water is unavailable, the level of local illnesses in women and children especially is much higher. Men tend to be working out of the community, so women and children bear the brunt of the lack of safe drinking water. The RURAL WATER PROJECT decreases illness and brings health to families by allowing local communities to be in control of their own water sources. In August 2016, we went to Haiti and set up plans for building, maintaining, and repairing all thirty-four rural water tanks. We worked with a trustworthy longtime colleague to have him be foreman for the project, and had him bring on a principal engineer. Both of these people are Haitian and both are local. They will be working with people from each of the small communities where one or more tanks will be built and everyone will work together to maintain the tank(s) in that community. The woman and her daughter in this photo are using a leaf to direct a trickle of water from the root system of a tree. This root system is on the side of a river bed. It is about to be rainy season in Haiti and the river will fill, covering this water source. If we can build a tank here to capture this tiny flow, and have the walls of the tank be higher than the impending flood level, then this tiny water source can continue to serve the people here. That is what we hope to do. At the heart of the project along with basic health, is the establishment of stronger community bonds through focusing on what matters most: water is life. In a desperate country like Haiti, basic sanitation and health concerns are often overlooked out of necessity and out of lack of knowledge. One Hundred For Haiti will let people know by way of Creole interpreters and direct conversation that basic concepts concerning sanitation and how to establish it, clean water and how to maintain it, and the importance of a solid water source and how to protect it, can lead to stronger community solidarity by way of good health. 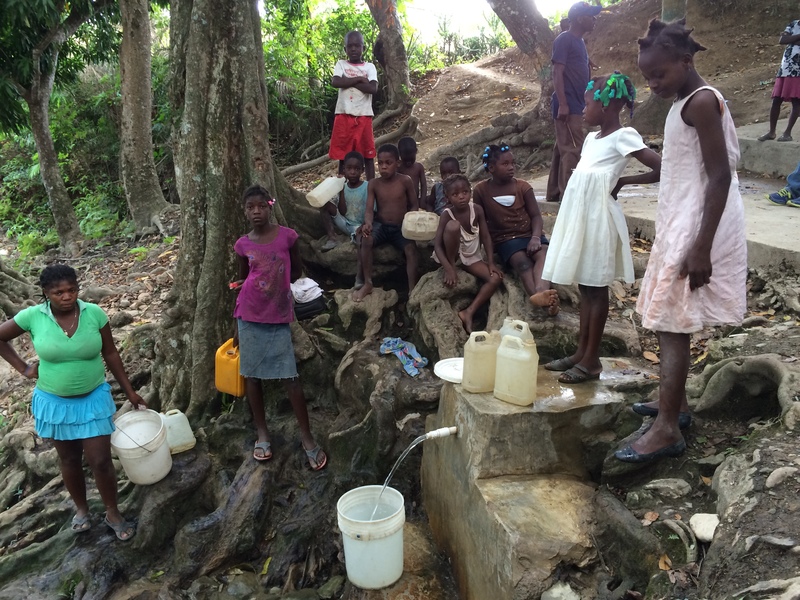 At the core of The Rural Water Project is the idea, and it is working effectively, to capture natural spring water (which potentially has cholera in it after any disruption to the water table by hurricanes or cyclones – all of which are common in Haiti) in cement tanks built by local Haitians. The water in those tanks can then be treated before and after any storm to kill the cholera. Again, since the start of the project, deaths from cholera (which had been rampant before) have dropped to ZERO in the region. One Hundred For Haiti plans to keep it that way. Help us do what we do. Sign up for a recurring monthly donation. The link is on the right. Some people donate $100 a month, or $20. Some donate $5, and others $1 a month. It all adds up more than you realize all those donations are used for raw materials for building the tanks, for Haitians to work on the construction, and any chemicals needed to treat the water. 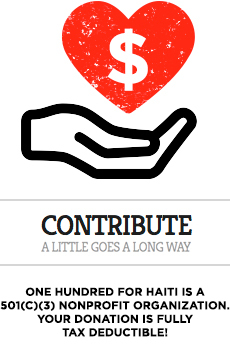 One Hundred For Haiti is a fully fledged 501(c)3 non-profit. Water builds community. At a tank built by One Hundred For Haiti, a group of people gather to wait to fill whatever makeshift containers they have. The water is clean, and as a result people are healthier than they would have been. This is the start of everything. Water is life. NOTE: Haitian Creole / English speakers = please download our Cholera Information Sheet (translated into Creole) here for distribution in Haiti.